What if you could skip past all the calling, qualification and lead management? What if skipping past the hasstle of dealing with leads meant saving time, money and never having to worry about where to buy leads from and whether they were even worth the investment? That is where Demand Monster comes in. opportunity and we help shorten that process for you. Whether you are looking to cut costs, save time or increase the number of qualified appointments, Demand Monster can assist you with a B2B appointment setting service. With 50,000 appointments set, we have what it takes to guarantee your appointments. Ending the sales vs. marketing battle for good! Sales says: The leads from marketing aren’t qualified. SOLUTION: Demand Monster schedules guaranteed appointments with your potential decision makers. Give your sales floor exactly what they want and watch what happens! So what is it that sales wants? Exactly what we provide - Appointments tailored to the exact needs of your sales team! YOU Choose the Decision makers you want sales to speak with - Even the Decision maker’s title and role! The Ultimate All-In-One Solution To Your Marketing Problems. Now let us prove it to you. Click the button below to end your sales vs marketing battle for good! Decision makers at the Owner, Director, VP or C level of contact. Intelligent Data – Demand Monster works with you to select the best industries and lists to target key prospects for your products. A campaign can only be as good as the prospect list so we work hard to make sure we are working from the most targeted and up-to-date list possible. 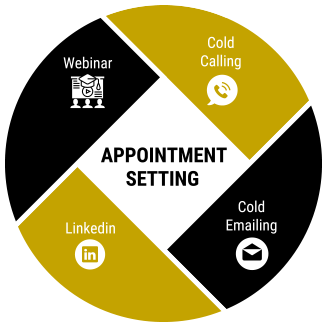 Cold Calling – We believe that strategic and well thought out call approaches are vital to the success of our client’s appointment setting campaign. We work with our clients to develop a concise and powerful call approached based on your value proposition, success stories, objectives and appointment setting qualification criteria. Linked-In & Nurturing System – We use a multi-touch prospecting approach whereby we follow-up with prospects after our calls via LinkedIn. This social sales approach helps to engage a prospect, generate interest in your products and set qualified appointments in today’s digital age. 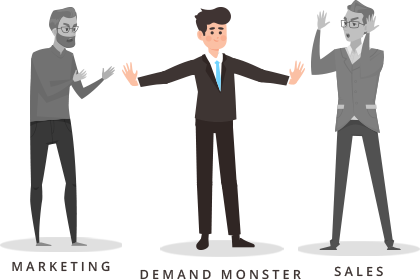 We Train Our Employees to Sell – Demand Monster has a training program to teach and assess our sales agent’s understanding of your products/services and its value proposition. Webinars – Engage potential customers, build a captive audience, and generate leads with Demand Monster’s robust webinar program. You provide the topic and the speakers, we run the webinar and ensure your ideal prospects are in attendance. Cold Emailing – We bring qualified appointments right to your door with a custom-built outbound email strategy targeting your ideal industries, companies, and job titles. Generating leads and setting appointments involves a full team dedicated to your business. Demand Monster is the only business development service in the country that GUARANTEES B2B appointments, and only charges you per appointment. No retainers, no hidden fees. Just qualified leads. We work with top tier companies to deliver marketing results.